Rankin Township High School "Rangers"
Rankin (population 617) is located in far east-central Illinois. The town was platted in the northwestern corner of Vermilion County and is situated in Butler Township. Bloomington sits just 50 miles west of Rankin and Champaign is 30 miles southwest of town. The Illinois Routes of 49 and 9 intersect at Rankin. The Pigeon Creek flows through Rankin. The Norfolk & Western Railroad travels through Rankin as well. The town was established in 1872 along the new set of railroad tracks laid in the area. The village was named after the land owners, David and William Rankin. The history of Rankin's former high school is in need of research. We know through a photo (view below) provided by Vern Hofer that the town of Rankin was established in 1872. 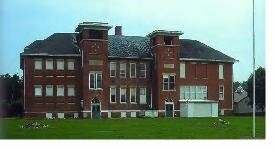 It is probable that Rankin High School was established in the late 1800s, maybe as late as the early 1900s. Rankin High School served the community for over eight decades. The 1980s brought with them consolidation talks between the school districts of Rankin, Wellington, and nearby Hoopeston-East Lynn. "I am one of the 15 students that made up the last graduating class of RTHS. We are the class of 1987. 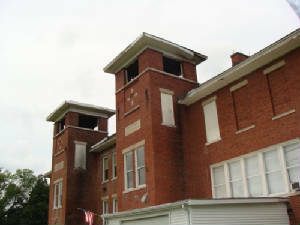 The high school "deactivated" to Hoopeston & the elementary school students moved into the high school building for the 1987-88 school year. I am not sure when we lost our elementary school to attend Hoopeston." The effort to form a new school district was finalized in 1986. 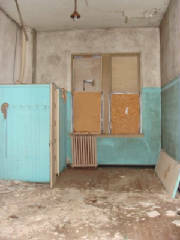 The voters decided to deactivate Rankin High School at the end of the 1986-87 school year leading to the creation of the Hoopeston Area School District. The high school for the district was located in Hoopeston. The original Rankin High School building, constructed in 1902, still stands today and was remodeled into a private residence. 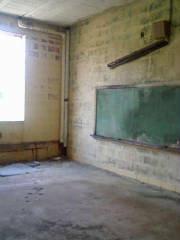 Photos of the school can be viewed below. 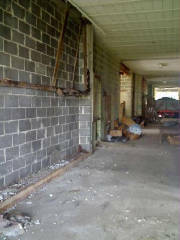 The second Rankin High School building, probably constructed in the 1950s, was razed in July of 2009. Rankin HS team nickname: the "Rangers"
School Fight Song: "Rankin High School"
We Yell, We Yell ! When they meet Rankin High! It is a fact that baseball, basketball, cross country, and track were offered for the boys of the Rankin (www.ihsa.org). The girls likely competed in basketball, track, volleyball, and softball. School fight song, coach's names, and team records are all items we are searching for. Three District Championships were the hi-lights of the Rankin High School boys basketball program. All of the titles were won in the mid-1940s to mid-1950s. Unfortunately team records and coach's names of many of these and other great RHS teams are not currently available. Coach W.J. (Doc) Colteaux was a long time fixture in athletics at Rankin High School. He coached the basketball program from the 1948 season through the 1966 season. Some basketball scores from the IHSA Tournament were located on a website titled "Illinois Postseason Basketball Scores". The scores we located are provided below. Watseka lost in semi-final round. Rossville lost in semi-final round. Armstrong lost in semi-final round. Stockland lost in title game. 1975-76 Postseason scores, coach's name, and record needed. 1982-83 through 1986-87 Postseason scores, records, and coaches' names needed. Bob Shepard - Was one of the leaders for Rankin on the court during the late 1930s and early 1940s, eventually garnering All-State honorable mention honors in 1940-41. One male harrier earned a position among the elite runners in the State of Illinois by finishing in the top-twenty at the IHSA State Class A Cross County Meet! Coach W.J. (Doc) Colteaux led the Rankin harriers from 1948 through the 1978-79 season. 1981-82A Shawn Young 19th Place!! Three male thinclads won a total of four individual medals at the IHSA Class A State Track Meet. Head coach of the Ranger track program from 1948 through 1979 was W.J. (Doc) Colteaux. The Rankin boys competed in baseball at least from 1948 through 1965. The sport may well have been played in the fall and spring some years. The coach for all seasons from 1948 through 1965 was W.J. (Doc) Colteaux. Team records and other statistics are needed for the baseball program. The ladies are not mentioned on the IHSA website. If you have any information on the Lady Rankin High athletes or the other sports offered to the boys please write to us so we may add the appropriate information to this page. The Illinois Theatre Festival is the largest, non-competetive high school theatre festival in the world. It was organized in 1976 by teachers from the Chicago suburbs. This festival is still going strong as they perform at the University of Illinois (Champaign-Urbana) and Illinois State University every other January. 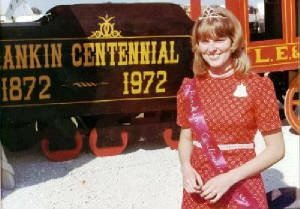 Rankin High school participated in this festival from 1977-78. "Rankin High School had a very competitive chess team in the 1976-1978 period, and won scholastic bowl in the Regional tournament during one of those years as well. RHS also had a debate and extemporneous speaking team in 1977." "Rankin High School was deactivated in 1987. The vote was done in the fall of 1986 and passed. I know this as I was to graduate in 1988 from Rankin and had to go Hoopeston my senior year. At the time of its closing at the end of 1987 the last yearbook picture captured all the remaining faculty and students in one group picture. The total people in the photo were 46. This was the entire student body and faculty. Angie Tyler. Class of 1988. Rankin/Hoopeston "
"The big brown building originally housed both the grade school and high school until sometime in the early 1950s I believe. I started first grade there in 1955 and the new high school had already been built. 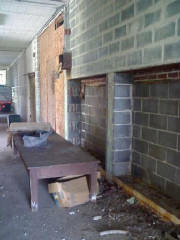 The stage which is pictured is in the big brown building was upstairs near the seventh- and eighth-grade area. All through my grade- and high-school years there were no ladies' competitive athletics. All we had was P.E." "My dad was a coach at Rankin HS for many years. His name was W.J. (Doc) Colteaux. As a coach, his biggest thrill (as told to Fowler Connell, Commercial News sportswriter) was winning the Vermilion County Track Meet in May 1969 with a stirring victory over Hoopeston, 48-47. My Dad passed away in 1989 and my Mom in 1999 so the information I'm getting is from my brothers, John Colteaux and Jeff Colteaux who were both athletes at RTHS." 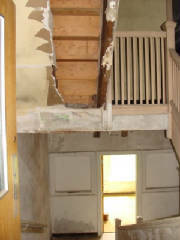 Below are photos of the Rankin High School building built in 1902. Photos were taken in 2009. The building now serves as a private residence. 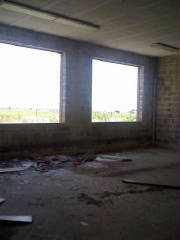 The following photos were taken of the interior of the newer Rankin HS building prior to its complete demolition.